Mary Kinsella Scannell, vice president for early education and care, plays with baby Kinsey Ferraguto and toddler Margot Vorhees. 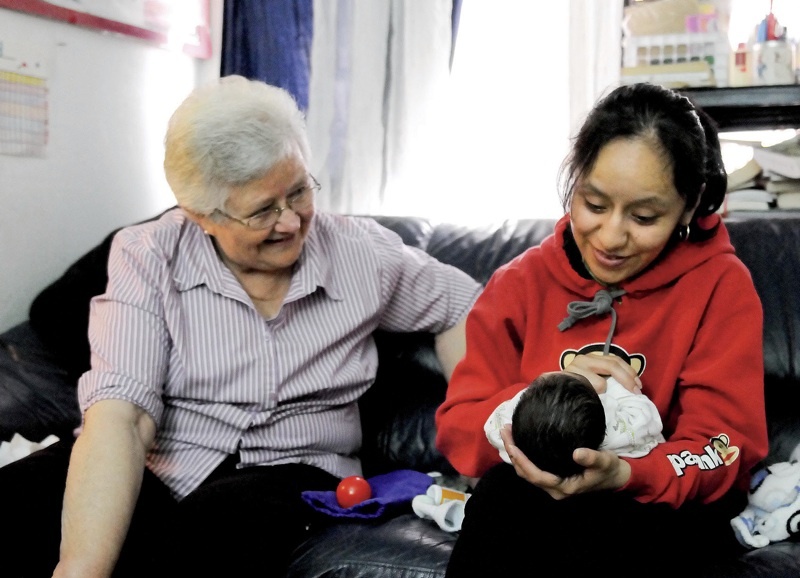 In East Harlem, Susana Saldivar and her son Xavier receive a visit from Sister Suzanne Deliee, a nurse with Little Sisters of the Assumption Family Health Service. In Dorchester, Liam Denver has a hard time saying goodbye to his mother, Kim, as teacher Carolyn Christopher offers comfort. In Dorchester, Solaylah DePina says goodbye to her mother, Saida Neves. 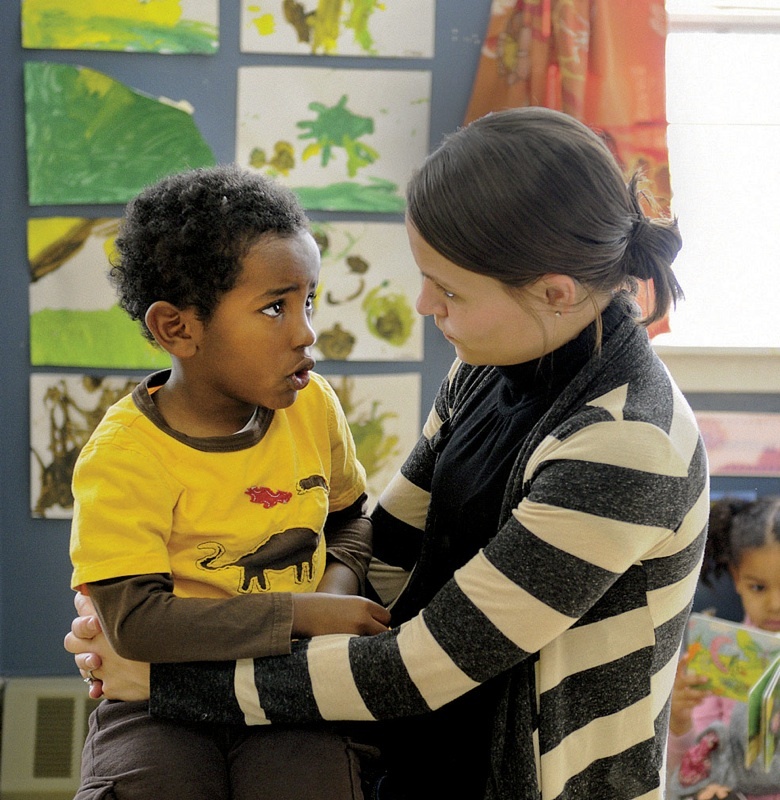 In Dorchester, Amos Monteiro leaves his son, Desmond, with teacher Stella Ortiz. In Dorchester, at the Boys & Girls Club, kindergarten-age children play with teacher Melissa Ryan. Teacher Carolyn Christopher comforts Joshua Medicke after his mother leaves. Teacher Meghan McDonough plays with preschoolers. At the Boys & Girls Club, Joshua Coleman drops off his son, Noah. Katty Morocho (center), a social worker for Little Sisters, teaches client Zenaida Vega to bake a cake while Vega’s nephew, Miguel, looks on. Vega hopes to find work at a bakery. The social workers are concerned with child development, broadly defined: they recognize that professional and personal fulfillment supports maternal mental health. During the same visit, social worker Sarah McLanahan plays with Miguel. Sister Suzanne Deliee climbs the steps of the East Harlem brownstone, rings a bell, and is buzzed in. The visiting nurse has come to see Susana Saldivar and her four-week-old son, Xavier. He was born prematurely, at 33 weeks, and as Deliee asks questions, it becomes clear Saldivar is nervous about caring for him properly, even though he is not her first child. Xavier has not yet learned to latch onto his mother’s breast. While keeping him nourished with formula, Saldivar has been encouraging him to suckle. “That’s all you can do—truly,” the nurse reassures her. None of Deliee’s words are random or accidental. She is choosing them carefully to educate Saldivar about child development: preemies commonly have trouble learning to suckle; using a rattle is important to Xavier’s cognitive development. She is also assuaging fears: Saldivar doesn’t need an expensive toy for her son; she is doing just fine as a parent, even if Xavier isn’t yet proficient at breastfeeding. Deliee’s communication style typifies the unique and powerful approach to child development crafted and disseminated by the Brazelton Touchpoints Center , part of the Harvard-affiliated Children’s Hospital Boston. Deliee’s employer, Little Sisters of the Assumption Family Health Service , first sent staff members to the center for training in 2006; today, employees say the approach is integral to the agency’s holistic, relationship-oriented view of social services. The Touchpoints Center was founded by T. Berry Brazelton , professor of pediatrics emeritus at Harvard Medical School (HMS) and a celebrity among parents, known for his Emmy-winning television series and for his books, vividly illustrated with photographs of babies and toddlers. Sometimes called the “baby whisperer” for his ability to communicate with infants and understand their behavior, Brazelton is a towering figure in pediatrics, but he took his work in a new direction when he was in his seventies. With the center, he set out to propagate the principles of child development more widely. Instead of communicating directly with the parents of young children, he wanted to empower the people who work with those parents, not only by arming them with information about child development, but by teaching them how to communicate that information in ways that prime parents for success. Little Sisters serves a swath of Manhattan stretching from 96th to 125th streets, from the East River to Fifth Avenue; founded in 1958 by a Catholic religious order, it is mostly a lay organization now, in both staffing and funding, and seeks to serve the poor and marginalized and promote healthy family life. (Deliee herself belongs to a different religious order, the Sisters of Mercy of the Americas.) The neighborhood, once heavily Puerto Rican and Italian, has recently become home to immigrants from the Dominican Republic, Ecuador, Peru, Yemen, and West Africa, as well as African-American families. But the fastest-growing immigrant population, and the one most present in Little Sisters’ programs of late, is from Mexico. Although Susana Saldivar’s family did not immigrate recently—she has lived in East Harlem since she was a young girl, and speaks English well—their living conditions are modest: she, Xavier, and her older son, Louis, share a one-bedroom apartment with her mother and three younger siblings. As the baby becomes more alert, Saldivar hands him to Deliee, who gently begins to administer tests: weighing him, testing his reflexes, examining muscle tone. After she leaves, she will fill out a worksheet reporting on a wide range of measures: how Xavier responded to the sound of a rattle; how firmly he grasped her finger; how well he followed his mother’s face and voice with his eyes; how active he was in general. When he founded the Touchpoints Center, Brazelton had been practicing pediatrics for five decades, and had seen enough patients to identify clear patterns. He noticed that parents often became anxious just before a developmental milestone: when children were on the verge of taking a first step or beginning to speak, they would regress, seeming to lose some of the skills they had already developed. Subsequent research has found that these periods of cognitive disorganization occur at the same times across human cultures. Beyond studying brain development, Brazelton was also interested in the science of human relations: what was happening between children and their parents at these times? He saw the regression periods as not just challenges but opportunities. When parents appeared in his office, there was a chance for learning and connection. And if they could be warned in advance about periods of transitions, then they could understand their children’s behavior, leading them to feel competent rather than concerned. Brazelton dubbed the regression periods “touchpoints” because they so often brought parents into contact with medical or social-service professionals. A book followed: Touchpoints, The Essential Reference: Your Child’s Emotional and Behavioral Development (1992). Still, he knew it wasn’t enough to reach the largely higher-income, well-educated, nuclear families who had time to read his books. To educate more parents—and ultimately to affect the lives of more children—he decided to focus on the service providers with whom parents were bound to interact at one time or another: pediatricians, childcare providers (who were becoming increasingly important as the U.S. economic and social landscape changed), and social workers (who tended to serve the parents least likely to read his books). Brazelton assembled a team from Children’s, HMS, and the Graduate School of Education (HGSE) to begin developing a framework for teaching about the touchpoints. They sought a way to set this training apart—to ensure that the workers would retain the material and actually use it. The result was a set of Touchpoints principles: just as important as the substantive, scientific information on child development that course participants were learning was the guidance they were receiving in how to deliver that information so parents would be likely to absorb, remember, and act on it. 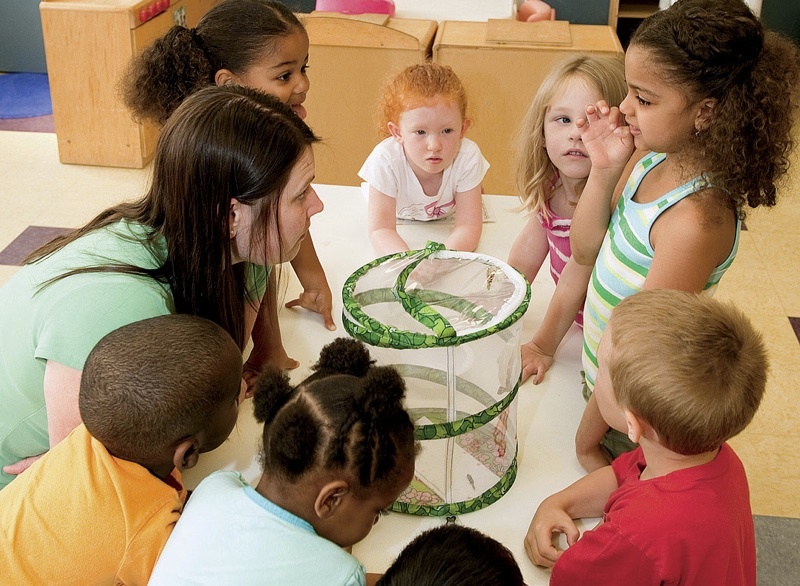 The Boys & Girls Club  of Dorchester , in Boston’s most populous neighborhood, first sent members of its early-childhood programs staff to Touchpoints training in 2007. Like Little Sisters of the Assumption, the Dorchester agency is now a Touchpoints site; its staff members have trained representatives from more than 25 agencies in the neighborhood so far. 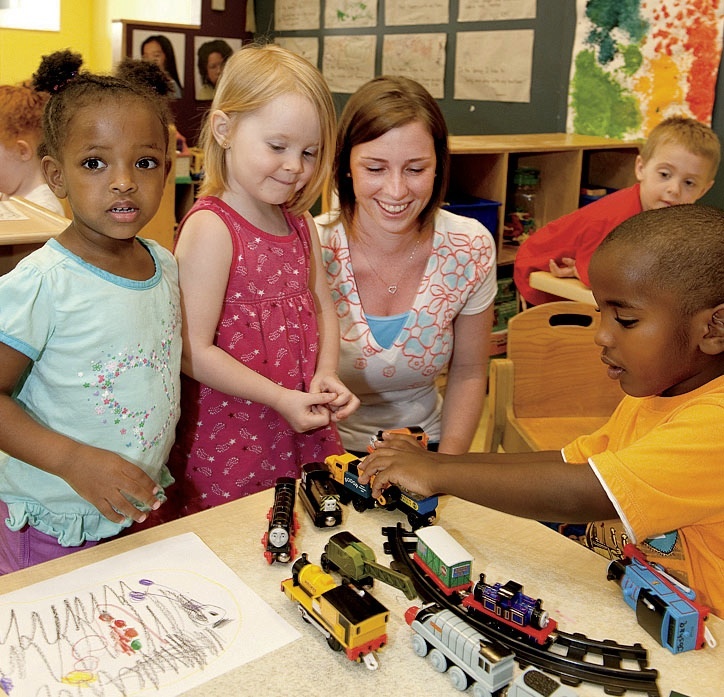 “We’re touching a lot of families,” says Mary Kinsella Scannell, vice president for early education and care, who oversees the early-childhood programs. Staff members readily employ the Touchpoints principles for problem-solving. Early education director Ellen Lucas has used the approach to reassure parents who feel guilty about leaving their children all day while they go to work. When one mother worried that her son didn’t even know her, Lucas pointed out how the child turned his head when he heard his mother’s voice. The mother’s face lit up; she was comforted, her confidence boosted, when Lucas simply pointed out behavior she might not have understood on her own. Carolyn Christopher, who works with kindergartners, used to shy away from asking about children’s home lives, for fear of prying. She now feels comfortable asking such questions: “You realize that everything affects the child,” she says—there is no impermeable wall between home life and school. Touchpoints posits that caring for a child means taking an interest in all aspects of that child’s life, and not stopping at the edge of one’s official responsibilities. Christopher now commonly calls or e-mails parents to discuss their children when schedules don’t permit them to stay and chat at dropoff or pickup time; before, she might have criticized them for not finding the time to stick around. In general, the Touchpoints approach makes parents feel valued—that the people who care for their children are listening to them and taking their viewpoints into account. This attribute, Touchpoints proponents note, may matter even more to minorities and the poor, who often face discrimination and condescension, and leave a meeting with a doctor or a teacher feeling diminished and inadequate. The approach is “not just about being nice,” Sparrow points out: there are measurable results when it is used. Home visits from nurses have proven helpful on all sorts of health and cognitive measures, but such visits are even more effective with Touchpoints: babies in Napa County, California, whose families received visits from Touchpoints-trained nurses were less likely to go to the emergency room. Their mothers breastfed them longer and were less likely to develop postpartum depression. These babies also scored significantly higher on the Bailey scale of motor, mental, and behavioral progress at six months than infants whose families received visits from nurses not trained in the approach. Touchpoints is structured like a set of Russian nesting dolls, with the same motif repeated at each level: just as training participants learn to pay attention to how they convey information as well as what they are conveying, the training itself is just as remarkable for how it teaches as for what it teaches. Trainees may come in saying that they can learn something from their poor, uneducated (sometimes even illiterate) clients, but getting them to act that way is another matter. Social and cultural currents lead them to believe that they are the ones with knowledge to impart, and make it difficult to move to a model of mutual exploration and cooperative learning. These professionals have often spent decades working with children; they are already highly knowledgeable, well educated, and very good at their jobs. Getting them to incorporate new principles into their worldviews—to change the way they do their jobs—requires engaging them on an emotional, not just an intellectual, level. Thus, participants learn the Touchpoints principles not by reading about them, but by experiencing them. The format encourages them to open up about professional insecurities, difficult situations they have faced, and what makes them angry about their jobs. It includes role playing, applied problem solving, and an invitation to honest criticism. When disagreements and conflicts arise, that’s part of the plan; processing reactions in the classroom prepares participants for similarly raw situations in the world outside. This, after all, is what the participants are learning to do with parents: value passion wherever they find it. The average pediatrician or teacher confronted by an angry parent would go on the defensive. Touchpoints teaches considering the parent’s point of view and remaining calm. Anger often means that the parent cares about his or her child; apathy would be a far worse sign. Another Touchpoints tenet also goes against the grain of workplace culture: a mistake is not a blunder to be regretted, but rather a welcome indication that one is venturing out of one’s comfort zone. Just as an infant appears to regress as he is learning something new, even highly educated, experienced professionals may look foolish when practicing a new skill. Numerous studies have found that children do better with confident parents than with parents who are terrified of making mistakes. If professionals are going to support parents as they make and learn from mistakes, they must practice what they preach by envisioning their own jobs, too, as a process of trial and error, no matter how much the professional context rewards having it all together. This compassionate, supportive approach may even help prevent child abuse by alleviating parental stress. Studies have found that abuse rates increase around some of the regression periods that precede developmental milestones. What’s more, children who are born prematurely—with the complications that often entails—and those with developmental delays are at greater risk for being abused, presumably because caring for them is more stressful for parents. In fact, Touchpoints teaches that, to prevent abuse, providers need to understand the experience of parents who are at risk of abusing their children. Sparrow, who spent years working on the inpatient psychiatric unit at Children’s with young patients suffering from abuse and neglect, says that too often, people who work with young children see parents as adversaries, and see their own mission as saving children from poor parenting. When a provider can understand that most parents don’t want to hurt their children, but are at risk of cracking under pressure and stress, then “you can partner with the parent around the challenge of being the parent of that child in that moment.” Besides, he notes, in most cases the best way to save a child from poor parenting is not to remove the child from the home—a drastic measure to be used only in cases where the child’s safety is in danger—but rather, to improve parenting by shoring up the parent’s skills. Touchpoints therefore encourages a focus on parents’ strengths. In Dorchester, for instance, Kinsella Scannell speaks of a drug-addicted father who brings his children to the Boys & Girls Club, rather than keep them at home where they’ll see him using drugs. She firmly believes that even this small caring act should be recognized. If the man feels shamed and stops bringing his children, that will ultimately harm them more. And over time, as trust takes root and grows, he may become open to seeking the help he needs and allow the agency to connect him to a treatment program. Little Sisters, too, is challenged to meet parents where they are, even when the circumstances are not ideal for child development. In East Harlem, most of the recent immigrants are from southern Mexico, where for many, the native language is the indigenous Mixteco. Many do not speak Spanish fluently, or read or write well enough to be considered literate; indeed, many of the parents have had no formal schooling at all. In small, crowded apartments where men need to sleep during the day because they work at night, children are kept from making noise. Instead of admonishing mothers that letting children run and play is important to their development, Little Sisters provides play groups where mothers can bring children to play outside the home. Little sisters operates out of a five-story building on East 115th Street. The façade is decorated with corrugated aluminum and cheerful red and blue panels between the windows. During the after-school hours, teenagers skateboard on the front sidewalk; cars drive by blasting salsa and reggaeton through open windows. On any weekday, the building is abuzz with activity. A food pantry and thrift shop operate. People come and go for GED classes, classes in English as a second language (and even Spanish as a second language for Mixteco speakers), play groups, a children’s music group, after-school tutoring, mentoring for teenagers, and a nutrition program that teaches kids to cook healthy meals with foods found in neighborhood bodegas. Still, many mothers, fearing crime or running into someone who will report them to immigration authorities, simply keep to their small apartments all day, and the children play indoors. Little Sisters is constantly trying to reach more families with its services. It starts before birth: clients are encouraged to refer friends who are pregnant so those women can receive home visits. Visiting nurses like Deliee watch for signs of postpartum depression, which would trigger a referral into other programs, and inform the new mothers about “mommy and me” groups with playtime for children and social time for parents, a mental-health support group for women, and home visits for families with older children. The approach reflects a belief that children are embedded in a web of relationships—family, school, community—and supporting healthy development means looking at all parts of the web. Employees at all levels of the Little Sisters organization, with all sorts of job functions, have been trained in the Touchpoints method. One of the three trainers on staff is Ray Lopez, whose job description—head of environmental health programs—on its face might seem to have little to do with child development. Lopez visits homes to help residents deal with infestation by pests—bedbugs, cockroaches, mice—that aggravate or even cause respiratory illnesses. His work relates to child development in that youngsters who suffer from allergies and asthma miss school frequently and can fall behind; what’s more, he often makes referrals into other Little Sisters programs based on what he sees during a visit. Lopez also finds that the principles of compassionate communication help him to connect to clients and make it more likely that they will follow through to keep their homes pest-free. Instead of simply telling clients not to use harsh chemicals, he finds out what they already know about pest control and what informs their beliefs, and asks questions: how do you feel when you mop with bleach every day? “People will say they get a headache or notice what it does to their skin,” he says, and draw the conclusion for themselves instead of rejecting his advice because they perceive it as an attempt at control. Adopting Touchpoints “was not a big stretch” for Little Sisters, an agency that had a tradition of looking at multiple aspects of a family’s life to support healthy growth, says executive director Gary Carter. Where picking up food at a food pantry might typically involve a five-minute interaction, at Little Sisters, the first visit involves a sit-down appointment that lasts an hour. In these initial interviews, social workers learn about new clients’ lives and consider whether they might qualify for other Little Sisters or public programs such as food stamps, home visits, or legal support for employment or visa issues. And even though social workers’ explicit purpose in making home visits is to observe, interact, and inform, all the while focused on child development, flexibility is encouraged. For instance, one social worker noticed depression in a client; knowing that maternal depression can harm a child, she not only notified the mother about mental-health services available through Little Sisters, but also explored vocational training options. When the mother decided she’d like to find work in a bakery, but lacked prior experience, the social worker spent one afternoon visit teaching her how to bake a cake.